The shower systems that are available from U.S. Patio Systems and Home Remodeling in St. Paul, Minnesota, are all made of nonporous acrylic. Acrylic showers have become immensely popular in recent years as they are easy to clean, resistant to the growth of mildew and mold, and capable of withstanding wear and tear without losing their natural luster. Our supplier, Bathwraps, manufactures high-quality acrylic shower systems in a wide range of styles, sizes, colors, and shape configurations. With help from the team at U.S. Patio Systems and Home Remodeling, you can trade in your old, out-of-date shower for a glistening brand new one that’s sleek, modern looking, and easy to take care of. If necessary, our team can rip out a tub that you no longer really use and install a shower in its place. 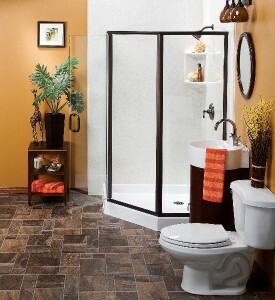 Our tub-to-shower conversion service is especially popular among those who want a more practical way to bathe. For more information about the shower systems that are available from U.S. Patio Systems and Home Remodeling in St. Paul, MN, please contact us today.